This project takes the listener on a very deliberate journey, wrestling with the idea that our questioning does not minimize our experience of God, but rather enhances our relationship with Him. These songs drive us to our knees before an impossibly unknowable God who made Himself known to us. 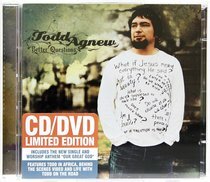 About "Better Questions CD & DVD Pack"
:This project takes the listener on a very deliberate journey, wrestling with the idea that our questioning does not minimize our experience of God, but rather enhances our relationship with Him. These songs drive us to our knees before an impossibly unknowable God who made Himself known to us.